The most precious thing on your computer is the data. No, not the latest and greatest computer you have purchased recently. The most valuable asset on your computer is all the data stored on it, especially what you have created, collected, processed, organized for your work, learning, or even entertainment. Now here are some cold hard truth about data and the associated risks. More than 95% computer users have experienced data loss in some point of their life. Data loss cost US businesses $11.8 billion in 1998. 6% of all PCs will suffer an episode of data loss in any given year. 30% of all businesses that have a major fire go out of business within a year. 70% fail within five years. 93% of companies that lost their data center for 10 days or more due to a disaster filed for bankruptcy within one year of the disaster. 31% of PC users have lost all of their files due to events beyond their control. Every week 140,000 hard drives crash in the United States. A 2013 poll found that 30% of computer users had NEVER backed up their data. According to a 2013 report, 55% of disaster-related downtime stems from hardware failure, 22% from human error, and 18% from software failure. More than half (53%) of the SMB organizations surveyed revealed they do not conduct daily backups. According to a survey of SMB organizations, 32% responded saying backup is not an efficient use of their time. Simple drive recovery can cost between US$5,000-10,000 and still success is not guaranteed. Refer to a USA Today 2006 News article. Refer to an Information Week 2011 News article. For many businesses, data is their lifeline. Data loss can make them to go out of business. Accidental delete, virus attack, hacking, disk failure are some of the common reasons for data loss. Fire, earthquake, storm, flood are some of the natural calamities which result into data loss. As it shows above, data loss has been known and documented to be a major problem for long time — for about 20 years (definitely a lot more than that). The volume of problems has increased with growing ubiquity of computers among households and businesses. The widespread use of mobile devices has made the risk potential even higher. Add to that the recent rise in malware attacks and cyber-crimes, e.g., WannaCry, Petya, Bad Rabbit etc. It seems there is no end in sight for security breaches, information leaks, and data loss / damage. All this is scary. So, how to address such risks to your precious data? The best option is to practice “Safe Computing” (outlined below), and also take regular backups, which is a simple defense against data loss due any reason. a) In case of a data loss, recovery of an earlier version (that is close to the latest) is the main reason for backup. b) “Sync” vs. “Backup”: Sync is convenient and popular, but Backup is more robust, dependable, and legally compliant. c) Network Attached Storage (NAS), especially with RAID, is a common and good backup medium. d) Regular backup is a legal requirement for businesses in some countries. e) Backup, preferably automated / scheduled, should be part of every business’s Disaster Recovery plan. Backup is in general of two types — full and incremental. Full backup saves all the files and folders selected for the backup. It generates a bigger archive and takes longer, but has the full data snapshot. Incremental backup saves only the files that have changed or are new since the last backup (full or incremental). It’s smaller in size and less time to complete, but it depends on the last full backup and any incremental backups in between. It is a good practice to take a full backup after a significant number of incremental backups. E.g., if incremental backup is taken every day, a full backup can be taken once every month. Earlier restoration involved restoring the full backup, followed by differential backup, and then all the incremental backups – a tedious and time-consuming process indeed! Now all that can be achieved in a single step, such as “Structure Restore”. With the prevalence of offsite / cloud-based email services, on-site email servers are reducing and email backup is becoming less important. Permission issues and PC unavailability are the biggest reasons for backup failure. Automatic data backup is much better than manual backups as the latter takes extra time and can be forgotten or skipped under pressure. A well-defined data retention policy is as important as the backup policy and arrangement. In general a business should have a different backup and data retention policy for each of its departments. Be paranoid… OK, just be super careful — do not trust random email attachments, links in emails, unknown websites / tiny URLs etc. Please refer to Ransomware (in Wikipedia), in particular the “Mitigation” section. HOW TO BACKUP DATA ON WINDOWS? a) provide “Structure (one-click) Restore”, reducing the restore effort by up to 99%. b) allow versioning of the backed up files. c) enable backup to cloud as well as various local storage. With the use of “Structure Restore”, the need for differential backup is almost eliminated. SARANGSoft WinBackup Business performs decentralized backup with centralized control — providing best of both worlds. a) The backup effort gets distributed across all the computers and is not imposed on a single computer. This results in more flexibility as well as faster backups. b) The network remains clog-free as the files are not examined or transferred over the network. c) Enables configuring multiple backups – use different backup specification for different computers or even for the same computer. d) (Unlike many other backup products) Doesn’t force the users to put their files (to backup) in a single folder. Multiple folders on a user’s computer can be specified to backup. e) No need to have a single folder-set apply to all computers. Specify a different folder-set to backup for every computer. f) It’s a rare backup software that provides both Individual (flexible) and Common (easy to use) Selection of folders to backup — see more on that below. g) Specify a different backup destination for each backup specification. It helps categorize the destination depending on backup contents or the department. h) Get access to a number of important reports. Click on individual column headers within the reports to sort the data, toggle between ascending and descending order the same way. i) To backup data locally (not accessible even to the administrator), set the backup destination to local storage media such as External USB Hard Disk / CD / DVD. Specify a different folder-set for every computer to backup; not necessarily the same folder-set to backup for every computer. (If Individual Selection is tedious) Specify a common folder-set for all the computers to backup. NOTE: If there are permission issues in the network and you are unable to perform Individual Selection, you can still go for Common Selection of the folders to backup. Individual Selection offers you flexibility, whereas Common Selection offers you ease of use. It’s you who decides what you want. 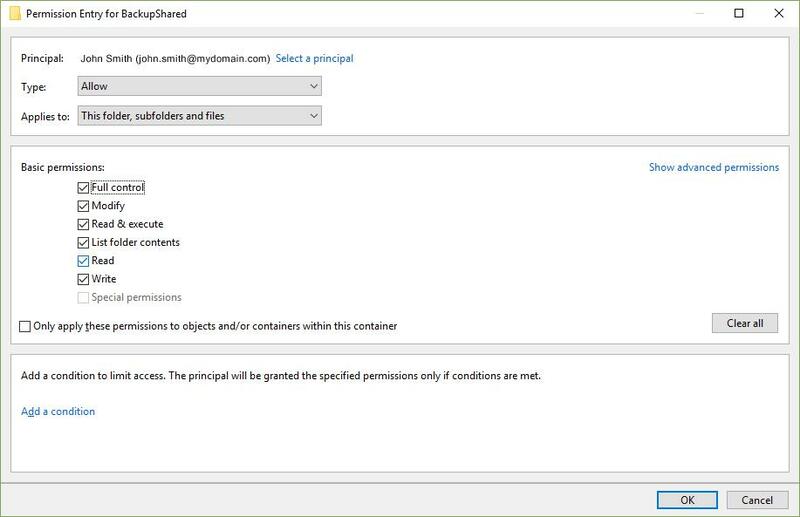 Use the same User Id to launch the “Admin Console” and configure backups as what was specified while installing WinBackup Business Server. Scheduling may fail due to permission issues or unavailability of the remote agent computer. Use the ‘Failed Schedules’ report to retry scheduling at a more suitable time. To re-schedule an existing backup, load it in ‘Manage Backup’, go to the schedule options page, modify the schedule, and click ‘Start’ on the Progress page. ‘CloudScape‘, bundled with WinBackup Business, helps upload backup archives to public cloud storage ‘Amazon AWS-S3’ and ‘Microsoft Azure’ for added resiliency and protection. NOTE: The AWS and Azure accounts must be your own. SARANGSoft does NOT provide such accounts along with its backup products. If you feel lost at any point, or do not find what you need, or for any other problem, use the context sensitive help on any topic by just pressing the ‘F1’ key on the keyboard or the ‘Help’ button on the toolbar. There are two technology options for corporate level backup – push and pull. b) Pull mode backup: Backup software pulls the data from individual PCs and then backs them up. All work is done by a single “Backup PC”. Backup open files too (except on Windows XP, Windows Server 2003/2003-R2); no need to close files before backup. Use Backup-on-the-Go for users who remain disconnected from office network for major part of the day (e.g., sales, field support team members etc). Most backup applications fail to backup if the target computer is not in network at the scheduled backup time, but WinBackup Business backs up at the scheduled time to a local disk and automatically transfers the backup archives to backup destination when the computer is back in the network. 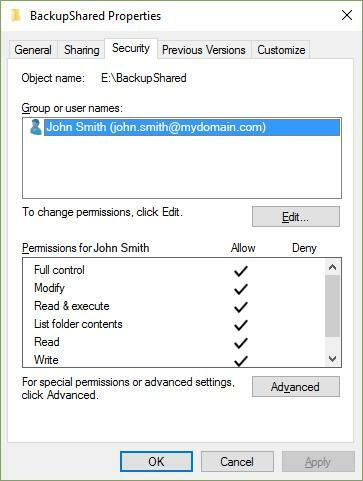 Configure for the powerful AES encryption for every backup, so that only the intended user can open the backup files. Get email notification when the backup process completes on a computer. Restore operation on a large archive can take quite some time. WinBackup Business can notify through email when restore is complete. Restoration is decentralized, thereby enabling respective users to restore according to own requirements without bothering the administrator. Restoration is made easy using Structure Restore. Restore the latest version of all the files in one go. To restore an older version of a file, use the Restore Point functionality. To restore all files created or modified on/before a certain date, use the Advanced Filtering option. Backup is essential for computing. Some of the backup tools are hard to use, or inflexible, or expensive, or all of those. Now you have options that work well and do not cost much. Data backup is like taking an insurance on your data. Just as we cannot predict what will happen with our life and property the next moment, and take cover of a good insurance, the same is true for our data too. Our precious data may be lost due to various reasons – natural disasters (earth-quake, flood, storm, fire), man-made havoc (theft, arson, violence), equipment failure, hacker attack etc. Backup acts as a good insurance against all such incidents. So, let’s make sure to regularly backup data. It’s most common take backups onto another storage device, such as an external USB drive or a network share. It’s definitely a good step, but such storage also can be targeted by malware and virus. For example, if you map a network share to a drive (such as map \\myserver\backupshare to the drive x:) or attach an external USB drive to your computer, malware can identify such a drive and do the same damage as it does to regular drives in a computer. To protect the backup drive from malware attack, take the following steps so that the drive / folder is accessible ONLY to your dedicated backup user account as explained in our other blog post “How to Handle Ransomware Threat: Be Cautious and Backup Data“. 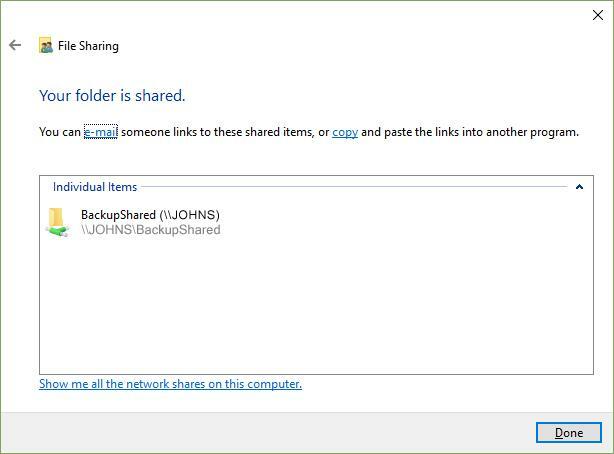 NOTE: Though the following set of steps use the folder name “BackupShared” as an example, DO NOT use such an easy-to-guess account name. Choose something suitable for your case that does NOT include your name, username etc. 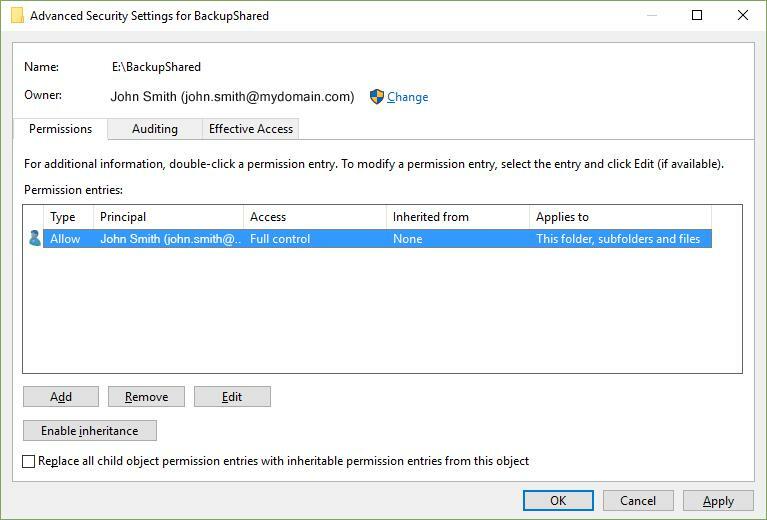 a) Right-click on the folder (in this case E:\BackupShared as an example), and from the context-menu click on ‘Properties’ option. b) Click on ‘Security’ tab to select it. You will see the dialog below. c) Click on the ‘Advanced’ button. You will then see the dialog below. d) Click on the ‘Disable inheritance’ button, which will show the following dialog. 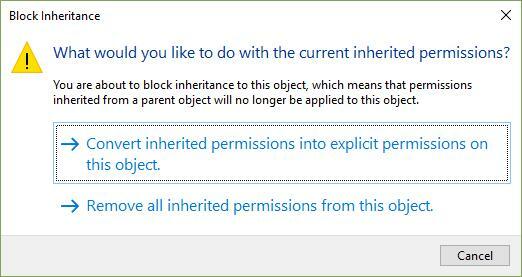 e) Select the option ‘Remove all inherited permissions from this object’. f) Remove all ‘Permission entries’ (if any) from the following dialog. g) Now click the ‘Add’ button in the above dialog, and you will see the following dialog. h) Click on ‘Select a principal’ and you will get the following dialog. i) Specify name of the backup-only user created in step (b) above and click on ‘OK’. j) You will next see the following dialog. 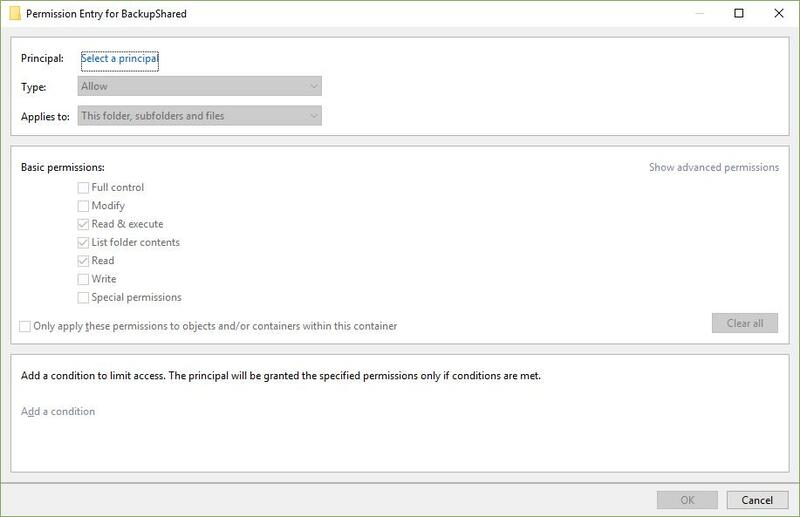 In the ‘Basic permissions’ section, select ‘Full Control’. The other options within this dialog should be as shown below. Then click ‘OK’. k) Now click ‘Apply’ in the following dialog. 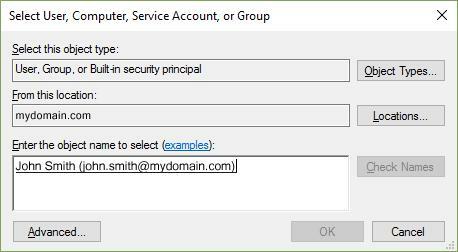 l) Change the ‘Owner’ by clicking on the ‘Change’ link in the above dialog. This should be the same as the backup user. m) Click ‘OK’ to close the dialog. You will come back to the following dialog. n) Open the ‘Sharing’ tab, and click ‘Share…’. o) Then you will see the following dialog. p) If the “backup username” does not appear in the box, click on the dropdown list and select ‘Find people…’. 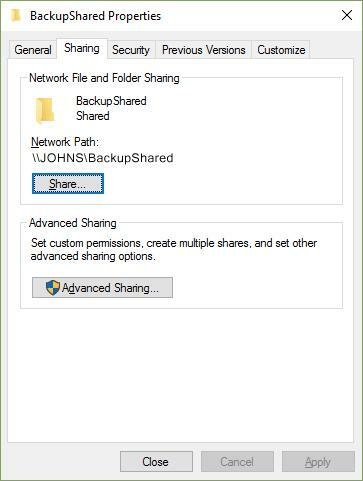 Specify the “backup username” in that dialog and click ‘OK’ to come back to the File Sharing dialog. Then click ‘Add’. 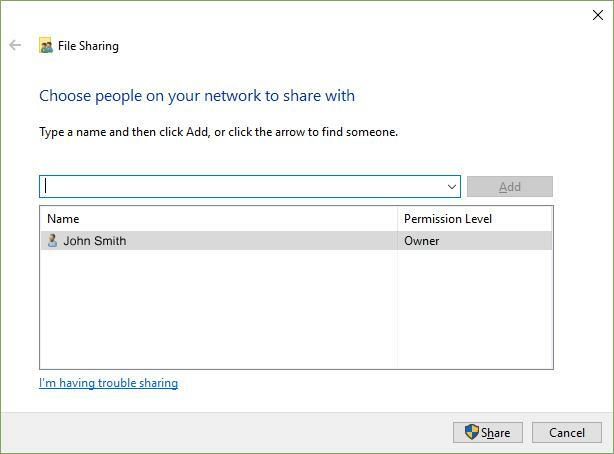 Choose ‘Owner’ or ‘Read/Write’ as the ‘Permission Level’ for the user. q) Click the ‘Share’ button to share the folder. Click ‘Done’ on the following dialog. 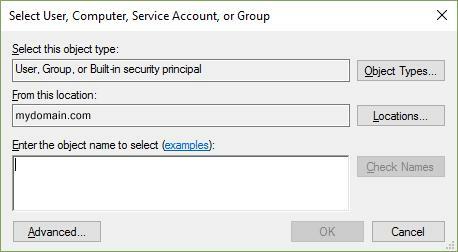 r) Click ‘Close’ in the following dialog to complete the security settings. Yes, you are really done! It took quite a number of steps to go through, but now you have secured a folder / drive from unapproved access by malware and hack attacks. This is a safe destination for your backup data. Go ahead, start the backup process now. Why spend money on a backup program or bother setting it up? I know my data is safe. This commonly-held belief was shattered by the recent WannaCrypt / WannaCry ransomware. The attack started on Friday, May 12, 2017, and has been described as unprecedented in scale, infecting more than 300,000 computers in over 150 countries. Some of the people had to pay up hoping to get back their data, while others just lost it. It is estimated that more than US$80,000 has been paid in ransom so far, but the total loss due to this attack might be as high as US$4 billion (according to CBS News). “Ransomware” is a type of malicious software that blocks access to a user’s data generally by encrypting the files and displays a message demanding ransom payment. It won’t allow the user to get back the files until a “ransom” is paid (generally through untraceable ways of Bitcoin). Ransomware may also encrypt the computer’s Master File Table (MFT) or the entire Hard Drive. 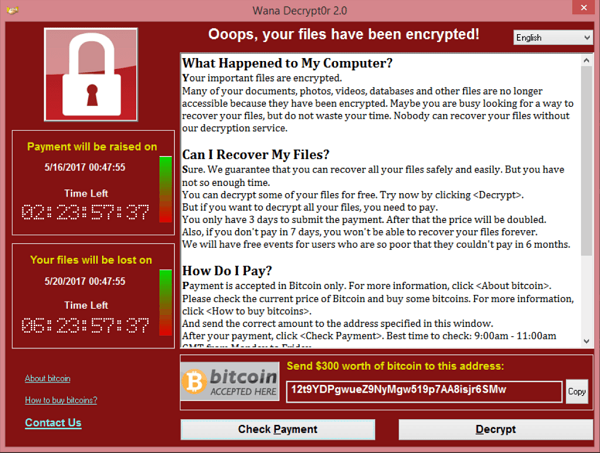 The WannaCry ransomware enters a network (an organization’s LAN) via an email attachment or from a compromised website. Once in the network, it uses a vulnerability in the Microsoft’s implementation of the Server Message Block (SMB) protocol to spread across the entire network. Back in March 2017 (i.e., nearly 2 months before the attack happened) Microsoft provided a fix for this security vulnerability for Windows Vista and higher. Recently Microsoft has released a patch for the outdated and out-of-support Windows XP Operating System too. This ransomware encrypts the files in a computer and demands a payment of around US$300 in Bitcoin currency within 3 days or US$600 within 7 days. After 7 days, the files will become completely unrecoverable. Ransomware attacks have happened before, and will happen again, and again. On May 19 another new ransomware, Xdata, has started spreading mainly in Ukraine. So, how can we prepare to protect our valuable data from such attacks? There are two ways of handling this threat. 1. Prevent or minimize the chance of a malware attack. 2. Minimize the effect of being infected / hit by a malware. The above two-prong proactive defense is important, because one of the possible ways of getting rid of the malware “industry” is to frustrate the players, who are not some intelligent-but-bored teenagers having fun, rather organized criminals are into this to make money. If they can’t break into enough computers, either to cause disruption (and thereby derive some perverse pleasure) or make money (which is the main goal), their interest will eventually fade. Let’s do our part to weaken, and over time hopefully get rid of, this menace. There are some basic precautions all of us need to take to minimize (and hopefully eliminate) the threat of various malware. a) Always use genuine software – Operating System (such as Windows) and applications (such as Office, Photoshop, browsers etc.) – from reputed companies and their suppliers. If you get pirated software (especially OS) from someone or download random software from the Internet, you are immediately vulnerable to different security threats. b) Always keep your OS updated with the latest updates and service packs. Do not use an outdated OS. c) Use a good up-to-date anti-virus to protect your system. Using an ineffective anti-virus is equivalent of using a door lock that anyone can open without the required key. Microsoft provides free download of its own anti-virus and anti-malware (Security Essentials and Defender). Also, regularly update the virus definitions. d) Avoid using the computer by logging into an account with administrative privileges. It’s safer to do day-to-day work from a limited privilege user account. e) Avoid visiting unknown or unreliable websites, and do not accept to run any script or application, if prompted by the websites. Also, use recent (preferably latest) version of one of the top browsers – Chrome, Firefox, Internet Explorer (11 only), Edge, Safari, Opera. f) Avoid installing browser plug-ins or extensions from unknown providers. Keep vulnerable plug-ins or extensions disabled. g) Do not open an email attachment from an unverified source, sometimes even from supposedly known sources such as friends or colleagues. Never run any attachment directly from the email client. Always download the attachment and run a virus scan on it before opening the attachment. h) Do not insert any random media device (USB drive – flash or hard disc, SD-Card etc.) in your PC. Such media devices might been used on a compromised / infected computer. If need be, format it, or scan it using an up-to-date anti-virus before plugging it into your PC. In spite of all the precautions, it IS quite possible to still get infected / hit by some malware. For such scenarios, safeguard what the attacker is aiming for – your data. NOTE: In such a case, you will need to re-setup the computer (such as reformat the hard drives, install OS and applications, reconfigure as per your needs), and then restore the data from existing backups. First Rule of Safety – Take regular backups. Use a good backup tool to regularly backup your files and folders, preferably scheduled to run automatically. There are lots of backup tools at different price points for every OS. An application like SARANGSoft filexpertez for individual PC backup costs just US$19.95 (one-time license fee). More advanced network backup tool like SARANGSoft WinBackup Business starts at less than US$100 for 10 PCs. It’s a very small price compared to losing all your valuable data to ransomware as well as virus or hacker attack, natural disasters, equipment (such as hard disc) failure, or accidental deletion. Take the following steps for a secure backup arrangement. 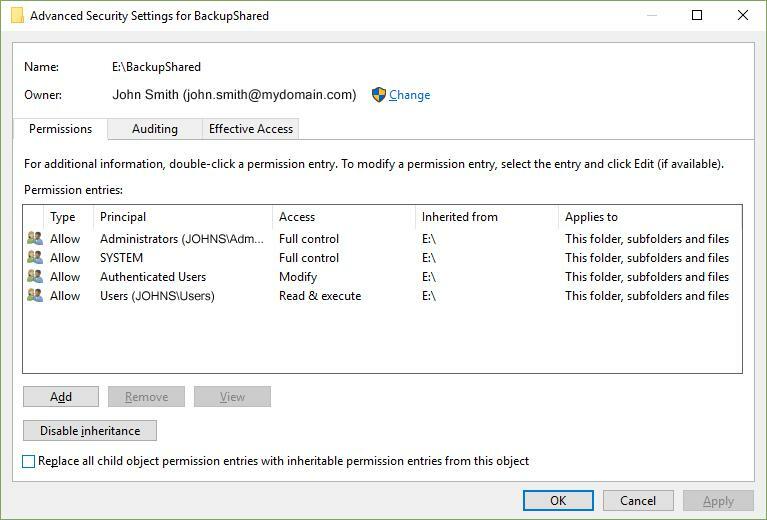 a) Dedicate an administrative user account for backup only: Create a user account for backup only and assign administrative privileges to it. Avoid logging into this account other than backup purposes. Choose a strong password for this account, e.g., use 10 or more characters, with a mix of upper and lower case, numbers, and special characters, and avoid your own name date of birth etc. Do not store / save the password anywhere in the PC. NOTE: Do NOT use names like “backupuser” or “mybackup” or “backupadmin” etc. for the backup user account, which can be guessed by hackers. Pick something different and uncommon, but definitely NOT using your name, username etc. b) Create a backup destination accessible only to the dedicated backup user: Create a backup destination folder, either in an attached external USB drive or in the drive of another computer within your network. 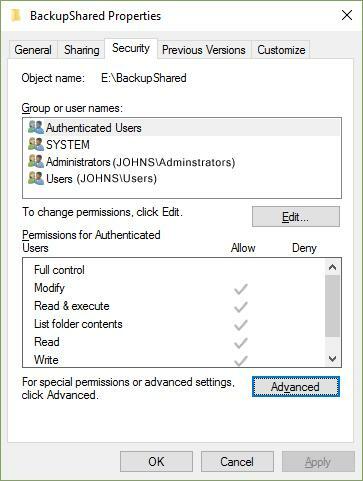 Assign full access of this folder to the backup user account created in step 2(a) above. Do NOT provide access to any other user for this folder, not even to ‘SYSTEM’ account. If this folder is in a different computer of your network, share it only to the dedicated backup user account of step 2(a). 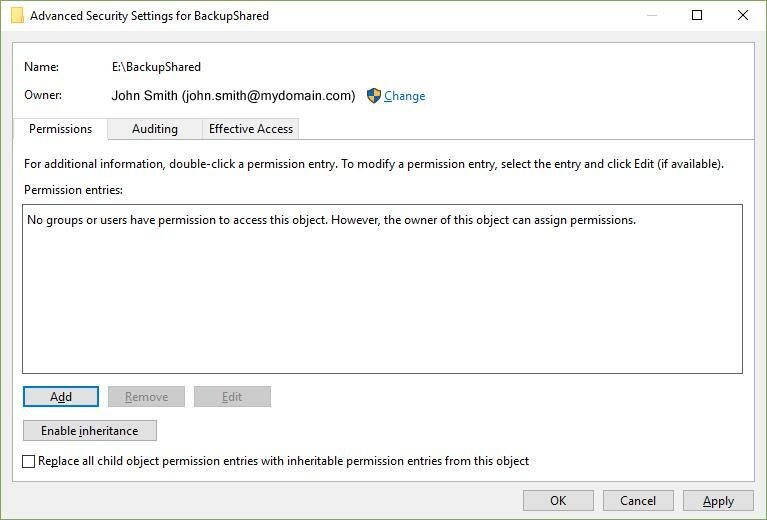 Follow the detailed set of steps shown in our other blog post “Steps to Create Backup Destination Accessible only to a Specific User”. c) Use cloud storage as backup destination: You can also choose to store the backup archives in a cloud storage such as Amazon AWS S3, Microsoft Azure or one of your choice. For example, SARANGSoft filexpertez enables direct backup to AWS-S3 and Azure as part of the backup definition process. Using local storage for backup is fast and convenient. Backup to cloud involves a little more work and recurring cost, but it also provides additional safety. d) Schedule Automatic Backup: Schedule a backup to run periodically (e.g., every night) on the computer. Identify all your important documents and folders to be backed up and include those in your backup. Ideally, a full backup should be scheduled to run once a month or quarter and an incremental backup should be done every day. You can choose depending on your own / organization’s needs. e) Run the backup manually once and also schedule to run it using the dedicated backup user account created in step 2(a) above. Avoid logging into this account for anything other than backup purposes. Chose the “Backup Destination” folder created in step 2(b) above to store the backup data (archives). Now even if you lose your the data in your computer for any reason, including virus or ransomware attack, you are protected because you still have a backup copy of the required data saved in another location — in local or cloud storage. A recently published report by Gartner & Raytheon (Dec-2015) makes some security predictions for the year 2016. The picture is not comforting at all. The already scary level of attacks by cyber criminals will rise even more because of the cyber terrorists (including the “Syrian Electronic Army” or SEA in short), who will be working in sync with ISIS and other such groups. 1. The US Elections Cycle Will Drive Significant Themed Attacks: The level of use of social and online media for US Presidential election process will exceed all earlier instances. The candidates have started opening websites with their own profile and are regularly updating those with campaign schedules, time tables, issue-based debates etc. They are also using facebook, Twitter, Instagram etc. as campaign tools. A 2014 survey showed nearly 74% of US adults use social networking. According to a recent survey by Pew Research Center, nearly 92% of the Americans are on social media. Of them 96% adults read news on Presidential election there. They have less interest and trust in traditional media like TV, newspaper etc. The candidates also are paying more attention to their Ads in social media sites. This will make things easier for the hackers and spammers. Pretending to campaign on behalf of some candidate(s), they will present attractive / interesting topics or use offers as bait to trap / cheat users visiting social media as well as push malware, spam etc. in their email / computer. 2. The attack on Google, Bing etc. will reach an extremely high level. There will be attacks through facebook, Twitter “friend” / “connection”. Serious attacks like Highly Transient Web Threat (HTWT) will also happen. 3. Addition of the GTLD system will provide new opportunities for attackers: The top ten botnets like “Cutwell”, “Rustock”, “Mega-D” etc. will become even more powerful and active. They have been spreading spam to about 100 million computers around the world, which is 88% of all the 100s of billions of spam sent daily. In 2016, it might grow by 15 times or more! Since multinational corporations and marketing agencies are becoming increasingly dependent on online services and web-based systems, there is big growth in “cloud computing”. Now the cyber criminals / terrorists are making “cloud computing” systems as their major target. 4. The cyber criminals will attack the “traditional customer authentication” methods used for online banking and financial transactions to steal funds from bank accounts. There will be tremendous rise in the “Man in the Browser” (MITB) Trojan attack incidents. 5. The cyber terrorists will also attach in guise of lucrative offers in emails (possibly as attachments) with attractive topics, pictures, invites as well fake web links, so that you step into their trap to reveal important personal information. 6. The criminals will also use “BlackHatSEO” to get the fake sites and/or links in front of you in search engine results by suppressing the genuine websites. For this they will use various SEO techniques, including paid SEO. 7. Fake Advertisements in the name of reputed media houses will be used to inject virus into those organizations’ websites. The hackers and spammers will use the still-in-use outdated technologies, such as unsupported and unpatched old software. 8. The tiny URLs used in facebook and Twitter are quite popular among users. Since those are easy to utilize, the criminals will target the tiny URLs to bring people to malware-ridden 100s of thousands of fake websites. According to an estimate from a few years back by a security software firm, nearly 300,000 fake websites are launched EVERYDAY just to lure unsuspecting users and infect their computers with malware and virus. 9. The cyber criminals are going to use “SQL Injection” attack against the famous multinational banks, commercial and marketing companies around the world, including USA. Along with that they will use Phishing (stealing data through browser / email), Vishing (stealing data via phone calls), Smishing (via SMS to mobile phones) attacks. 10. There will be major increase in the cyber terrorists’ use of “foreign language spam” as well as “identity theft” attacks to steal our “digital signatures” for online (commercial / legal / financial) activities. The only protection is to be super-careful (being paranoid is OK), even for individuals, because our own personal finances can be ruined by such attacks. A whole lot of people have already been burnt by “ransomware” (a kind of malware). Phishing and Vishing are still going on, and people continue to fall for those. On the other hand, a lot of computer users are oblivious about upgrading their software — Operating Systems, Applications, Browsers etc., even if free upgrades are widely available. There are a lot of people who derive extra pleasure in using pirated software, without understanding how dangerous it is for THEMSELVES. The big software companies can afford to lose a couple of billions in lost revenue due to piracy, but a compromised computer can terribly affect an individual’s life or a small business. It really doesn’t cost much when it’s spread over the lifetime of a computer and software. However, some people still find it necessary to avoid paying the dues and lead a risky life. Also, some computer users indiscriminately download and install “free” software from the Internet. Is “free” a business model for anyone? Yes, there are some legitimate “free” (mostly open source) software organizations, but they are well known. Why use software from a random company that pops up in a Google search? Does anyone buy any other thing like that? In real life do you use an item handed out by a complete stranger? Hopefully not. The challenges are grave. The threats are real. The repercussions can be devastating. It’s worth being extra careful. Data have become intrinsic part of modern human life. We are constantly searching for data, right from the time we wake up every morning. While some of the data are live and online, a lot of data are collected, processed, organized, and stored for quick and easy access at any time. These data (stored in files and folders) are valuable for our personal needs. Those can be photos, videos, music, research outcomes, write-ups, important documents and so on. If those are lost for any reason, it would significantly affect our lives, professionally and/or personally (often emotionally). That’s why it’s easily understandable why we often fear of losing such data due to some unexpected problem. Though we often think about “data protection”, which includes guarding it against preying eyes and hands of hackers and such, “data backup” is intricately involved in the process. The term ‘data backup’ means to copy data files to another medium (such as a disk or tape) as a precaution, in case the original storage medium (generally the hard disk built into the computer) fails. Data backup is crucial for businesses as well as individuals. There are many ways that your data can be lost. The common reasons are hardware failure, corrupted files, virus / malware, accidental deletions, and of course natural disasters (storm, earthquake, flood etc.) or man-made disasters (vandalism, theft, terrorist attack, arson etc.). Let’s look at few safekeeping approaches to prevent data loss as part of a comprehensive data protection plan. It helps to develop a standard way of organizing and storing your files, so that you (and your users) will know where a particular kind of file are expected to be. Once this first step is done, backing up data files will be more accurate and precise, and it will save time and hassle while retrieving any lost data to its original location. Organizing files and folders is the key to a data protection and restoration plan. Once you have organized your files and folders, determine which are important for you. Though you are the best judge deciding what are your important files, here are some ideas for your convenience. Files you have not used (not viewed or edited) for a few years. Files you cannot remember why those are there. Files you know are not useful for you any more or are known be outdated. On Windows, most document editing applications save the document file in the ‘My Document’ folder, which is very well known. As a result, malwares and virus often target the files there, making the files vulnerable. Whether it is a virus or software failure, the majority of computer problems affect the Operating System. Quite often the solution is to reinstall Windows, and at times after reformatting that drive. In such an instance, you must make sure to copy / backup all of your own files (not the system or application files) from the drive, including the ‘My Documents’ folder; otherwise everything on the drive will be lost. You can create a separate drive on the same physical hard disk, and store all your own files and folders on the second drive. If the OS drive needs to be reset, your data drive will still be unaffected. It is also possible for the hard disk itself to go bad (disk crash), in which case all drives on that disk will be lost. You can replace the hard disk and reinstall Windows and the applications to get it back to working condition, but in this case your files and folders on the data drive has also been lost. To handle such cases, you can use an external hard disk to store your data files. Or you can just use regular backup from your data drive to an external disk. You can alert yourself to take a set of security measures to protect data loss, but if your data is not backed up, it’s very likely that you WILL LOSE IT. So, ensure that your data is backed up regularly, and test the backup to ensure that your data can be recovered when you need it. How often should you back up? That depends on how much data you can allow to lose if your system crashes completely. A week’s work? A day’s work? An hour’s work? Depending on that you have to schedule your backups. SARANGSoft filexpertez (file-expert-ease) for backing up a Windows PC. It’s a comprehensive file and folder management tool for home, office, school / college, everywhere. SARANGSoft WinBackup Business for backing up all PCs and servers in a Windows network (domain or workgroup) through a centrally managed arrangement. Both the products are feature-rich and flexible, yet easy to understand and use. These do not cost much, and there is a no-obligation 30-day free trial available. All of us are busy. There are too many things to do every day, and too little time! Even though you might be very sincere about regular data backup, it’s quite possible that you forget to run backup at times, and that leads to an inconsistent data backup arrangement. Ideally, backup should be arranged to run in a consistent manner without any manual intervention. Depending on the importance of your data, you may schedule the backup operation to run it automatically. The only thing you should bother about is to check that the backup are really happening. It helps if the backup program can send you a notification when it backup is done, either successfully or ending in failure (in which case you can look into the issue and fix it). Using encryption during backup of your data is another layer of protection for the data. Encryption changes the backed up data in a way to making it unreadable by anyone, except who has the password “key”, which allows him/her to decrypt the data back to its original usable form. There are various types of encryption mechanism available, and some programs use it. All the important files should be backed up locally first. Make sure that the backed up files are available at your office / home. That ensures for easy access and recovery, as well as control of the data. It’s a great idea to arrange for a different location than your office / home to keep a copy of the backed up files. It provides “redundancy” as well as prepares for “disasters”. If the local backup is damaged or lost for any reason, the off-site backup copy will save your day. Nowadays, it’s increasingly common to use cloud as the remote data storage. There are many benefits to using cloud storage, most notable being the virtual indestructibility of cloud storage and its accessibility. Files stored in the cloud are assured beyond any other level for reliability and those can be accessed at any time from any place with Internet access and your own user credentials. As far as the disaster recovery is concerned, data from cloud can be restored without any hassle. Also, the cost of cloud data storage and restoration is significantly lower than traditional data storage and restoration. SARANGSoft CloudScape is a unique cloud storage browser for the Windows platform to seamlessly integrate cloud storage (AWS-S3 and Azure) with local storage (PC’s hard drive). Its Windows Explorer-like user interface enables easy transfer (including drag & drop) of files and folders to and from cloud, thereby making cloud storage an extension of your local PC storage. It maintains full folder hierarchy between a PC and cloud storage, which is not very common for such tools. Making plans and implementing those takes time, effort, resources, and costs money. That’s why many of us defer doing it. However, the cost of not backing up data can be so severe, the upfront effort for the backup process is worth everything you put into it. Absence of data backup made Mumbai Mantralaya fire turn more disastrous. A tragic incident of fire has caused a lot of damage at the Mantralaya in Mumbai. Lives have been lost and a number of people have been injured in the fire. There is report (http://news.in.msn.com/exclusives/it/article.aspx?cp-documentid=250206858#page=1) that more than 90% of nearly 500 computers have been destroyed by the fire. Loss of data is the worst impact of such incidents, because the hardware and software can be bought and replaced, but not the data. On the other hand, there was a problem at RBI, Kolkata, because of which a PC with vital data got badly damaged beyond repair. There within less than 1/2 hour, the data of that PC was restored from the latest backups. Contrast the two cases — in one place most data is lost vs. lost data is quickly recovered.